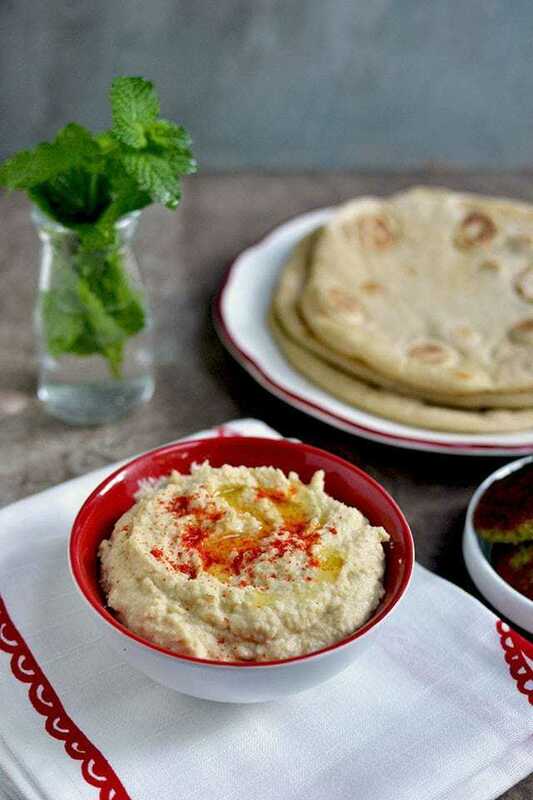 Hummus is one of the most popular Middle Eastern Dip. It can be used as a spread on sandwiches, wraps and even made a bread with it. Hummus is known as the poor man's food in the Middle East and it is a versatile dish. It can be served as a snack or with any meal of the day -- it is served for breakfast for Israel. It is an easy and delicious way to add protein to the diet. Puree warm chickpeas, lemon juice, garlic and ¼cup of water in a food processor 3~4 minutes, or until smooth, scraping down sides of bowl if needed. Add tahini and puree 2 more minutes or until the mixture has the consistency of soft cream cheese, adding 1~2tbsp more water, if necessary. Season with salt and pepper. Sprinkle some paprika and drizzle olive oil on top. Serve with pita bread, tabbouleh and falafel. How to cook Chickpeas from Scratch: Rinse and drain dried chickpeas and soak them for 8 hours or overnight. I wasn't too prepared to make this dish, so I soaked the chickpeas in hot water and kept changing the water every 1 hour and the chickpeas were nice and soft in about 5~6 hours. Drain soaked chickpeas, then rinse and drain again. Place the chickpeas in a large pot with 10 cups of water, bring to a boil. Reduce the heat to low and simmer 90 minutes. Stir in 1tsp baking soda, if desired, after the first 1 hour to get creamy smooth chickpeas. Remove from heat, cover pot and let stand for 30 minutes. Skim off any chickpeas that have floated on top. Drain well. I usually pressure cook my chickpeas which gets done with much less water and in much less time.